Send for this new FREE Guide and learn how to lower your blood pressure, lessen your risk of cardiovascular disease, and detect heart attack symptoms. Did you know that by age 60 your heart has beaten over two billion times? Sometimes faster, sometimes slower, but always beating. It doesn’t get any time off—not even for a minute. With such reliability, it’s easy to take the heart for granted. And too many people do—until something goes wrong. This new free guide shares what you should do for a healthier heart right now. You’ll learn the symptoms of a heart attack and heart disease…the distin-guishing signs of trouble…and latest breakthroughs in treatment. What is heart disease? What is hypertension—and why does it concern my doctor so much? Is an enlarged heart really bigger? Should I worry about a heart murmur? What is arrhythmia? What are congestive heart failure symptoms—and just what is “failing”? This free report will tell you. You’ll be briefed on the causes and consequences of coronary artery disease, of heart failure, and of cardiomyopathy. You’ll learn strategies (and secrets) for better cardiovascular health. And you’ll gain the ability to assess and ad-dress heart attack symptoms—whether your own or a loved one’s. This is information you can take to heart. You’ll learn how to dramatically reduce risk factors, successfully manage a cardiac event, and vigilantly foster your heart’s continued health and well-being. The report is yours to download now—absolutely free! “It will feel like an elephant on your chest.” Or maybe it won’t. When it comes to heart attack symptoms, misinformation abounds. Your heart can experience just as much injury from a heart attack preceded by no tightness in chest. And what about pain in left arm? Sometimes yes, but it could be the right arm, or both, or neither. How important is it to recognize heart attack symptoms quickly? Ask any EMT. According to the American Heart Association, survival rate for out-of-hospital cardiac arrest is about 10%. And more than 700,000 people in the United States have a heart attack each year. But what brings on a heart attack? What triggers heart attack symptoms? Now you’re asking the right questions! It’s coronary artery disease (CAD). It’s the gradual blockage of the arteries carrying blood to the heart muscle. And you can do something about it. That’s why we are offering you this guide FREE. Because you can do something. You can cut your risk of heart attack. You can be prepared if one occurs. You can control CAD. On your own, and with your physician, you can create an action plan to successfully manage coronary artery disease, keep its symptoms in check and lower the risk of a debilitating or fatal heart attack. the lifestyle changes that can initiate tangible and lasting benefits. Should you be taking a statin? How do doctors decide between stenting and bypass surgery? Is that daily baby aspirin still a good idea? What’s the “missing ingredient” of a sensible cardiac diet? Brought to you by University Health News, the guide answers your questions with honesty and impartiality. This is the heart-protecting information you need from a source you can trust. Download your free copy now! Not just heart attack: Symptoms that could be early warnings of congestive heart failure, cardiomyopathy, or hypertension. Heart attacks get the headlines, but the American Heart Association reports that 1 in 5 Americans will develop heart failure. But what is congestive heart failure? What are heart failure symptoms? Rather than “failing,” the heart is working harder because its ability to pump is progressively weakening. And you feel it. Fatigue, shortness of breath, swelling in the legs and feet, even mental confusion are congestive heart failure symptoms. Without question, heart failure is serious. This report will show you how to most effectively and successfully respond to its challenges. When “big-hearted” is not a compliment but a condition. Cardiomyopathy, sometimes referred to as an “enlarged heart,” occurs when a heart muscle becomes thicker and more rigid. As the condition worsens, the heart becomes weaker. Like heart failure, when diagnosed, cardiomyopathy can be managed and controlled. Too often cardiomyopathy goes undiagnosed—and untreated. Could you or a loved one at risk? Are you sure? In the free guide you’ll learn about the causes, consequences and symptoms. You’ll find out why family history is so important to your doctor. You’ll be briefed on new interventional therapies. And you’ll be introduced to an effective strategy to minimize your risk. This is reading that will do your heart good. Download your copy of this informative and instructive guide now. It’s yours absolutely free! The risk factor common to heart attack symptoms… heart failure symptoms… cardiomyopathy…and stroke: High Blood Pressure. High blood pressure—hypertension—affects one out of three American adults, according to the CDC. Your odds increase with age. At age 65, women are more likely to have hypertension than men. Blood pressure is the first reading your doctor takes. And with good reason. 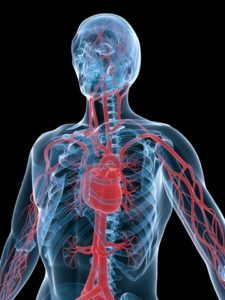 High blood pressure (HBP) can cause damaged arteries triggering heart attack symptoms. HBP adds to the workload of the heart leading to heart failure. HBP can cause the heart to enlarge. The telltale symptoms that your blood pressure is severely high. Plus, vital information about treating and preventing a stroke. Many adult men and women fear a stroke even more than a heart attack. The prospect of irreversible disability and loss of inde-pendence is difficult to contemplate and worse to confront. Like heart attack symptoms, stroke symptoms can begin well before the event. They can develop over a period of hours or even days. The report details the most obvious and important signs of stroke. You’ll learn why prompt and proper diagnosis of the stroke type is critical. You’ll be briefed on a gold standard treatment that can dramatically improve the chances of recovery from an ischemic stroke. And you’ll read about the two most important preventive steps you can take to avoid a stroke. Protect your heart’s future—and yours—with this new Guide that’s yours—absolutely free! Don’t wait. Get your copy now! P.S. Did you know that heart failure symptoms may actually get worse, not when you’re active, but when you’re resting. High Tri 457. BP 141/110. Taking medications, fish oil. Need diet info. I am sure to get informational guidance how to take proper care of my heart in your report. Yes would u please send me your free report about hbp? Need all information regarding the heart. Especially hypertension and medications. Need all information regarding the heart. Especially hypertension and medications. Please send me the report. my interest is to reduce LDL. I yet have four stent for familiarity. Want lower blood pressure & good foods to eat & excerise besides walking. Do not want statins. Need product price list as well as some explanations of some of the products offered. Thank you for in formation. Good advice always wel ome. Long time subscribed to news letter. Will continue and recommended you to clients and friends. Karen E Gantt, Nutrition Consultants, Inc.
How to reduce calcium score in heart related problems. Thanks for the info.I need information about hypertension ,exercise and diet.I want to get off medication (Amlozaar-H) I have had it for 4 months weighing 90kgs Bp140/90 now 128/78. My husband have low level pulse rate..55 only per second.. What can I do?? Is this problem for any health? ?